From a lovely cabin, near a very large forest nestled in the Netherlands, Fleur Doornbos creates bears that reflect her overflowing love she has in her heart. 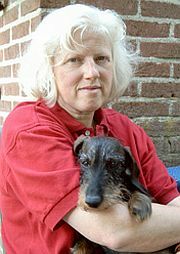 From her home she operates a “real” animal and teddy bear hospital; attending local teddy bear shows close to her home (Netherlands and Germany) so she can be “on call” for the live animals under her care. 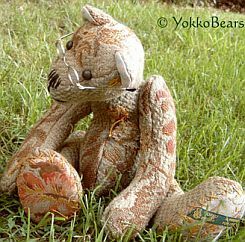 Her doctoring skills come in very handy when she becomes the “bear” doctor, helping repair teddy bears that become tattered or worn from their years of comforting. Inspired by her parents, Fleur learned to sew under the watchful eye of her mother, who made clothes for all the children in the family. “I was sitting next to her and loved seeing her sew and wanted to try,” she said. 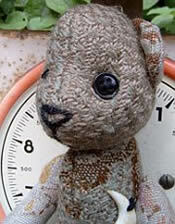 Fleur started sewing doll clothes and even clothes for her teddy bears. She was soon inspired to start making bears herself. Honing her skills while attending a school of costume design, she continued to learn drawing and sewing techniques. A slew of notebooks fills Fleur’s home, even outside the house, in places such as the stables, so when inspiration hits she can sketch and write her ideas. “I can get an idea by seeing the beautiful autumn colors in nature and also when a mother deer shows me her two babies”. 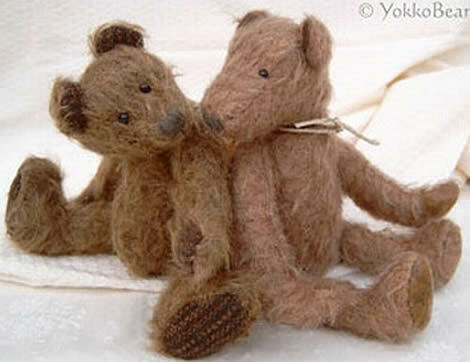 Fleur has channeled her feelings and intentions into creating her MemoryBears. 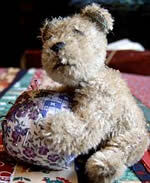 “I know very well what sorrow can do with a person and what it means, so I started to design a MemoryBear from the clothes of a beloved person,” Fleur said. 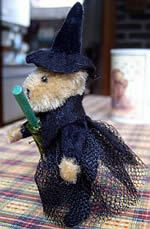 Using special pieces of cloth, such as a favorite coat, dress, or jacket, Fleur creates bears, either entirely or partly from these articles. 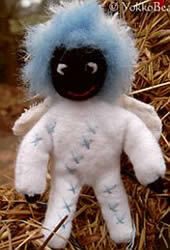 The collector can have something very special to remind them of their cherished person. “I recently designed a small bear for a man. I made it from his wife’s sweater. I made the bear small enough to fit in his pocket. He can reach in and feel the bear every time he wants or needs, and nobody can see it, and it gives him strength. I think that is good, ” expressed Fleur. 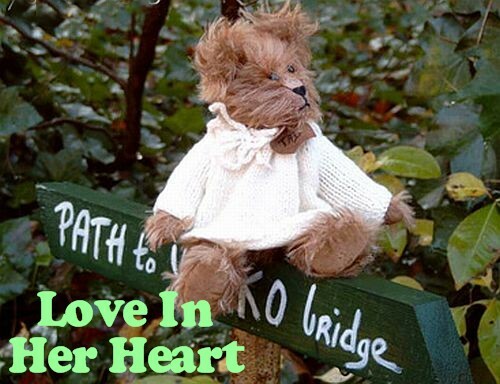 A lot of heart goes into each of Fleur’s bears. 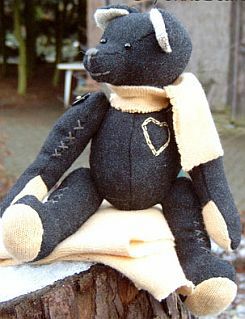 Whether collectors chose to create a MemoryBear or buy directly from her collections, such as the Desperate Forest Bears (modeled after the popular television series; Desperate Housewives), they can see that her heart goes into every design. “I love designing a bear. 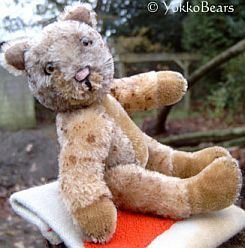 I love all the sewing, the bear shows and the contact with bear lovers from all over the world.” Describing her style of bear making as the “old fashioned way,” explained Fleur. 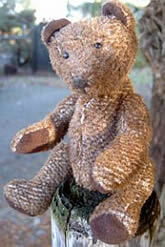 She designs only one bear at a time, sewing only that bear, all by hand, with care and attention to detail. “My clients tell me they can see my loving heart in all the bears.” Best of all, everyone who meets Fleur can feel the love too. Look under Bearsandbuds Doctor front page icon and learn more about Fleur. She's one of our Doctors!